Representative Bill Hixon, who also spoke with The Advertiser regarding the donation, called the money “very nice” and said, “I’m sure they [STHS] can use it,” echoed Massey saying, “It looks like they’re [Kinder Morgan] trying to buy friends.” Hixon said that he is not against Kinder Morgan but added, “I’m trying to make sure people’s private property rights are protected.” Hixon went on to say, “I don’t think a company that’s not a public utility should be able to use eminent domain to acquire property.” To that end, Hixon mentioned the companion bills currently in the House and the Senate that have been proposed to deal with this issue. Hixon said the bill is also on the Republican Caucus Agenda which means it is an issue that they mean to see accomplished this year. Interestingly, STHS is not the only local organization to receive funds from the company. 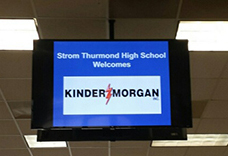 It has been reported that Kinder Morgan also made donations to the North Augusta Robotics team and the performing group JAMP. However, should the school refuse the money, they would not be the first local entity to do so. Neighboring Richmond County in Georgia declined a donation of $25,000 from the company last August which was to have provided for emergency call boxes along the Riverwalk.